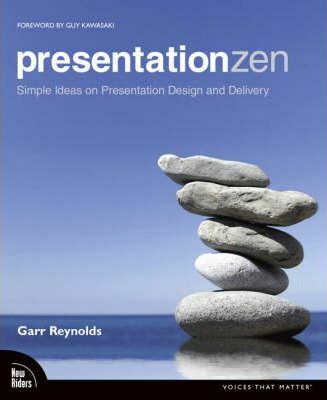 I have read Presentation Zen: Simple Ideas on Presentation Design and Delivery by Garr Reynolds. It’s a beautiful book in itself and terrific when it comes to its topic. The book gives lots of examples, it is inspriring and very well written. Presentation Zen is the kind of book one returns to for reference as well as for new ideas. I have made some notes while reading the book, things that stuck this time. Communication is about getting others to understand why you are excited. Communication is the transfer of emotion. Make slides that reinforce your words, not repeat them. What’s your point? Why does it matter? If the audience remember only one thing, what should it be? Simplicity is the essence of clear communication. Bring everything back to the core message. You have to believe in your message completely or no one else will. Garr Reynolds has a blog with the same name, Presentation Zen, that I suggest you subscribe to. Marion Chapsal recommended this book to me. We talked about books around presentations and she wrote If I could recommend only one this would be THE ONE! I am glad I followed her advice since I really love this book. Get Presentation Zen at The Book Depository. Posted on October 24, 2009 by BengtPosted in Bits and piecesTagged Books, Presentations, Review.